The Arlington Home Interiors team just returned from our annual trek to North Carolina for High Point Market, the largest home furnishings industry trade show in the world. With over 2,000 vendors and 75,000 attendees, High Point Market is huge. 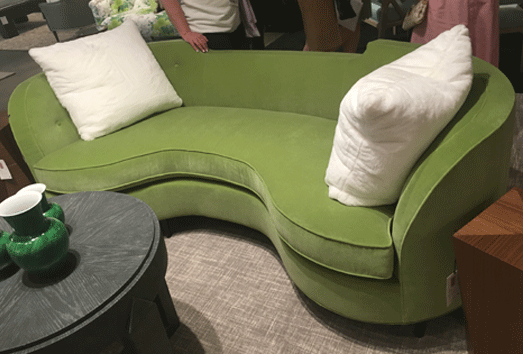 We spent four full days navigating showroom after showroom, spotting the latest industry trends, seeing new product releases, testing furniture first-hand and connecting with our vendors and colleagues. It’s always a challenge to squeeze the High Point Market experience into a ‘best of’ list. There’s just so much good stuff!!! Luckily, it’s a five-hour drive back from High Point to Arlington, so our team uses the time to pull together our notes while everything is still fresh and the excitement level is still high. Here's a list of the trends we spotted. Sleek lines, glamorous curves, exotic woods and luxurious embellishments - Art Deco is back! I love the details of deco, including; lots of contrast welting, metal plinth bases and channel backs on both sides of sofas and chairs, allowing them to elegantly stand in the center of a room. Wicker, rattan, weave, rope - natural woven furniture has definitely left its Boho roots and is showing up in chairs, table accents and lighting fixtures in every style of home. We’re still swooning over the creative canopy and four poster beds that were featured in all types of styles from traditional to super glam. The picture above is a gorgeous bed from the Robert James Collection in wood, rattan and metal. This is not the indoor/outdoor fabric of past years – these are soft velvets and chenille, tidy weaves and everything we love in fabrics. Plus, they’re stain resistant, fade proof and long lasting. Now your pets, kids and red wine enthusiasts can enjoy your white sofa too! Manufactures of performance fabrics like Crypton and Sunbrella made an impression at High Point. The days of hiding the recliner in the basement TV room are over! We saw several stylish, streamlined recliners that were as comfortable as their over-stuffed cousins. Here’s a picture of Mark – the unofficial chair-tester of High Point Market 2018 – enjoying a beautiful grey recliner by Vanguard. Although navy, pink and grey are still showing up in masses, we’re now seeing some sophisticated shades of green. We’re so excited to see shades of jade, olive, kelly and peacock appearing everywhere. We’ll certainly be doing some green rooms this year! High Point Market is a massive event but it’s so inspiring. Our whole team returned energized and full of ideas!